Attending the funeral of her abuser is the first step in putting her life back together as she is about to turn twenty-one. She struggles with the fact she never told anyone what happened to her, and that the grave they are mourning over is empty. She'd find it a lot easier to move on and believe in the future if he were in the box, ready to be covered with dirt. She fears the last thread of her sanity has snapped when she sees Lucas everywhere she turns, and can't escape a recurring nightmare. Is her tormentor alive, or is she imagining it? Is her dream triggered by past fears or is it a prediction of the future? Rule 1) The most dangerous people in the world are not always strangers. Rule 2) The scariest things imaginable are not those that can kill you, but those you can live through. Rule 3) The most horrible possibility is not what could happen to you, but what you could become. Review: The story is about a young woman named Hope. She is going through her life day by day unhappy, unfulfilled and repressing the most awful of memories from her past. Drowning herself in the family business, the running of the Hideaway Hotel, Hope is brought out of her slumber by the death of her uncle, Lucas Wellman. Having to go back to her childhood home to attend his funeral, Hope faces the demons she's been hiding from her whole life. While Hope struggles with her nightmares and paranoia, the lives of the people she loves start to crash and burn around her slowly but surely, and while in the crook of things, Hope discovers new horrors that she could have possibly prevented. Hope's family dynamic was somewhat complicated. Hope's mother, Carol, left her father when she was still pregnant with Hope. She met Luther Wellman while working as a maid for the Bishops, a prestigious family. If I recall correctly, Hope was about three years of age at the time. Luther has brothers but all from different fathers. His half-brother, Lucas, was also interested in Carol, and there was a tiff between the two brothers that caused a lot of tension in their relationship throughout their lives. Michael was another half-brother, and then there was their mother Helena. The Wellmans were a rich family, but Luther had always wanted to earn his way and not live off the fat of the family. He started a chain of hotels with his best friend, Frederick Bishop, just around the time Luther met Carol. So, Hope grows up with the Bishops' children, Joseph and Karen. Joey is Hope's age, and Karen is five years younger. The story was pretty methodical and twisted which is what kept me glued to my Kindle! We start out at a funeral where there is no body! Then, to pull you in further, we have a unexpected pregnancy with a very outlandish story behind it! Then, you have this weird feeling that your being watched, but you're not sure because you're a little on the paranoid side already. The book just gave me the heeby jeebies, and that was my first major clue that I was totally involved and loving the story! The author takes us inside the head of an abused child, and it was eerily accurate and very disturbing. My empathy felt so real that just the mention of Hope's abuser made me very tense and angry. I struggled with grasping how her own family, the ones closest to her, didn't know just by how Hope acted and was closed off that something very serious was wrong with her! I truly enjoyed the fact that Hope had such a good friend in Joey though. Joey was her rock, her protector, her best friend, and he was in love with her. If it weren't for Joey, I'm not sure Hope would have made it this far in life. 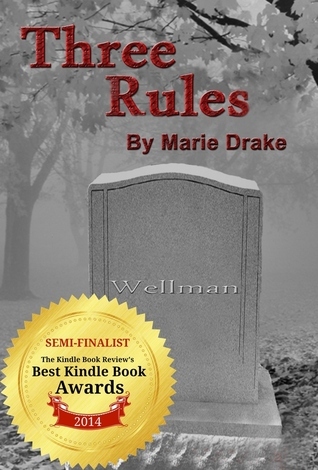 So if you're looking for a good thriller, suspense, heart-wrenching book, then I highly recommend Three Rules! This book had all the makings of a great thriller with characters you totally love and hate, root for and scream at, want to see die a painful death and want to see live happily ever after!